Olfaction, the process of smelling, is a dog's primary sense. Because of this keen sense of smell, dogs are able to locate everything from disaster survivors to blood sugar levels. K9 Nose Work is a dog sport, developed by professional detection handlers in the US, that enriches their instinctual ability to search for targeted odours using their amazing sense of smell. It is meant to be a fun sport for dogs of any breed, any age, including dog-reactive or fearful dogs. It's also good for injured, disabled or elderly dogs. Nosework is easy to learn. You don't need experience. Your dog has that! You become a team--your dog's job is to use the exceptional olfactory system and your job is to observe what your dog is communicating and provide timely high-value rewards. Nosework strengthens the bond between dog and handler and best of all IT IS FUN! 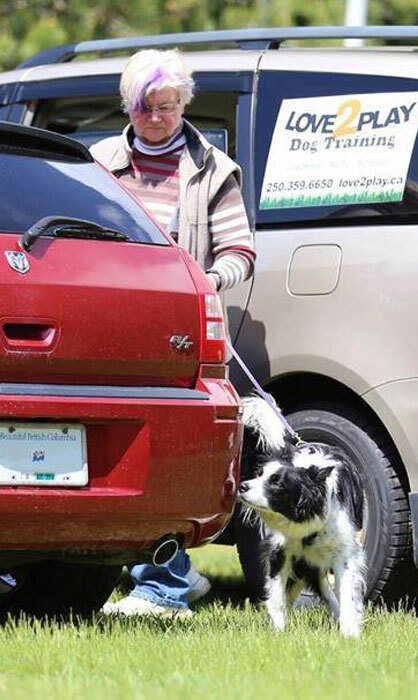 We start with foundation skills for the dog and handler: the dog develops confidence, problem solving, motivation while the handler is learning to observe the dog, leash skills, reward timing and letting the dog work independently. Contact us and find out what all the fun is about!